Mens shaving cream choices have come a long way. Improved quality male shaving products have been created for men who insist on the classic shaving experience and want to upgrade from the low-quality canned shaving foams. The hottest trend right now in male grooming is a return to the traditional “old school” wet shave. Men today are taking a great interest in how they can improve how they look and feel and they are open to try new un-experienced methods. A wide selection of mens skin care products is available to easily upgrade your shaving routine, make shaving a more enjoyable and smooth experience, and obtain premium shaving. A better quality, top shelf shave cream is one such “must have tool.” Quality products produce a rich lather to help moisturize the complexion and soften the beard for an ultra close, comfortable shaving experience. 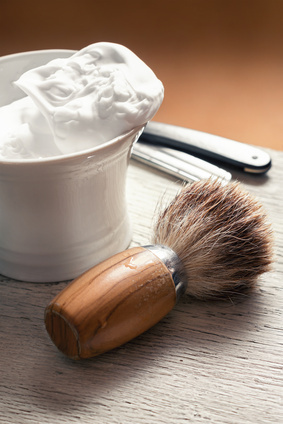 A good shaving cream helps protect against razor burn, ingrown hairs shaving rash, and prevent breakouts. The initial cost of a high-end product may be a bit more pricy although, because they are so concentrated they will prove to be a better value. A product of quality will last longer, and the formula will have a variety of healthier ingredients to soothe and nourish your face. As important as it is to find the ideal type of shave cream to suit your skin type and overall preference, the ingredients that make up the formulas are just as much a cause of concern. Many personal care products are made up with a host of potentially toxic substances and cheap synthetic ingredients that may dry out your skin and cause harm to its health. Low quality products can actually cause a great deal of irritation and allergic reactions to your complexion and cheaper variations can also hinder the fluent shaving process. The blend of the selected ingredients and concentrations used will affect the performance of the shaving cream. Look for ingredients that offer luxurious moisturizing properties such as Aloe Vera, Cocoa butter, and Shea butter to soften the hair for an easier clean cut, help keep water from escape, and rejuvenate cells. A pleasurable shave also needs a cream that is thick and emollient enough to provide a good cushion between the blade and your face, to reduce friction, and promote healing from any potential cuts or burns. Thickening agents such as stearic and myristic acid are often used. Look for ingredients with emollient properties, and natural oils such as coconut oil, olive oil, jojoba, glycerin, chamomile, and calendula. Soothing herbal extracts may also be found for their anti-inflammatory properties such as evening primrose and linden extract, as well as natural essential oils for their therapeutic properties and many pleasant aroma choices. The difference between low-quality drug store brands and top shelf specialty brands is the choice of ingredients in the formulations, proportions, processing method, and packaging. The best shaving products create a rich, thick creamy lather to help lubricate your face, provide great cushioning protection, prime the whiskers, and open the pores. The primary function is to create a comfortable shave so the razor will glide smoothly across the surface layer with-out unnecessary pressure, and elevate your overall shaving experience. A cleaner cut will also help prevent less irritation. Men will enjoy the soothing effect of a lavish shaving creams performance, throughout and long after shaving. Many product lines cater exclusively to men and offer a variety of shaving creams with unique recipes that have been passed down from generation to generation for years. These established companies specialize in high quality and offer some of the best shaving creams in the world. Many brands include unique key ingredients, and antioxidant nutrients in the formulas such as vitamins C& E for anti aging and nourishment benefits. Men, will notice that these high end shaving creams will take the edge off shaving and spoil you with the finest shaves you’ve ever experienced. A good quality shaving cream and brush (badger hair) will produce a richer lather and give you that luxurious feeling. A shaving brush is one of the best tools you can use to create a creamy lather, and raise the hair from the face for an optimum shave. Use a quality razor, make sure the blade is sharp, and change the blades regularly. As you shave, keep the blade from clogging and dulling by rinsing the blade in hot water to help keep your complexion lubricated, and remove accumulation of excess cream and hair. Prepping is important-Shower before shaving or apply hot water to your beard to soften the hair first and make sure its thoroughly wet before applying any mens shaving cream product. Take the time to learn the proper use of the razor. It’s quite an art to bring back wet shaving techniques-enjoy the luxury of a quality shave. Shave in the direction of your hair growth with short strokes, one-pass, and take your time. Men- Remember to follow a daily anti aging regimen designed especially for your needs. Pamper yourself and experiment with the many fine mens shaving cream products. Experience a taste of luxury.